The most complicated, and simplest binary clocks. We were going to take a break from posting clocks. Really we were. This one came in the tip line today though, and we just couldn’t pass it up. [Alex] has built, what might be the most complicated clock we’ve seen. At least, it would appear that way initially. 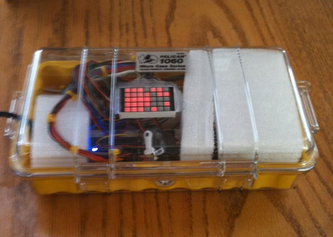 This Binary clock shows Hours, Minutes, Seconds, Days, and Months. He started with a picaxe, but eventually settled on an Mbed. Yes, he knows it is overkill, but it worked out pretty well. As for the simplest, that came into our tip line as well. [Toby] sent this in, and agrees with us that it is hardly worthy of being called a hack. However, in light of the complicated one above, we didn’t see any harm in posting its opposite. Check it out after the break. That’s right, he just printed a new face. Like we said, it doesn’t get much simpler. What the heck is this. The target site is a bunch of pictures, motors and stuff. Am I missing something here? I so want the simple one! Just for the geeky factor. So… whats the gearbox and servo for? I prefer the simple binary clock. I’ve got a “Simon’s cat” cat. I don’t need a clock anyways. @drone, This is a little bit better. Includes some text. @me, its for the hour chime. And yes i agree with svofski, there lies the problem. hah jk. I like the simple one…can never get numbers drilled into your head too much. Sometimes simpler is better. 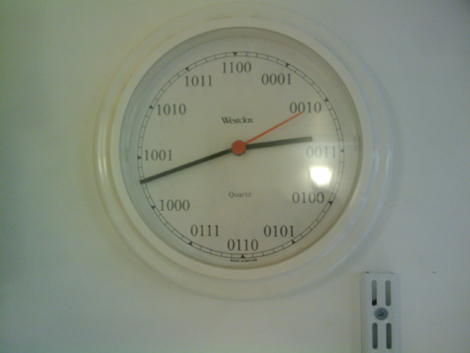 An analogue binary clock? This is madness! Bonus points for the Cyclone cells. In this age of RoHS, lead-acid cells don’t get enough love. That’s certainly an interesting design – looks more like a prop bomb from a spy film than a clock! a number of years ago i had cafepress make me a printed ‘binary’ analog clock such as that one. geeky, definitely not hacky thought. @ HackerK: Or within 50 miles of an airport or school. The LSB is on the right and high bits are strangely represented by UNLIT LEDs. Another example of an analog (hand made on etsy) binary clock. made on a mac.. really! Typical Mac made website… all pictures, no content.